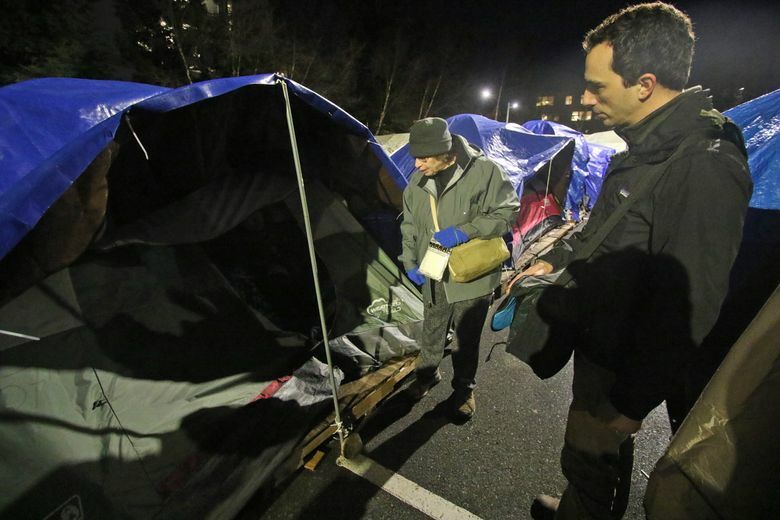 As part of a special course exploring the health effects of being homeless, University of Washington students are offering care to the 60 people living in a tent city that recently opened in a UW parking lot. Lois Thetford, a University of Washington faculty member, called out in a low voice as she and three UW students made their way through closely spaced, tarp-covered tents that make up Tent City 3 — the long-running tent encampment that recently moved to the UW campus. The temperature hovered near freezing, with a brisk wind blowing from the west. Most of the campers huddled in their tents, pitched in the UW parking lot that will be their home for the next three months. The camp was almost completely silent — it was impossible to know which tents were inhabited and which were empty. The next stop was the food tent, where Chris Pitre, a student studying to be a physician assistant, chatted with Jeff Bainter, a restaurant cook and Tent City camper. Did he have any medical issues? “I have this horrible cough, a persistent, horrible cough,” Bainter said. Pitre reached for his stethoscope. 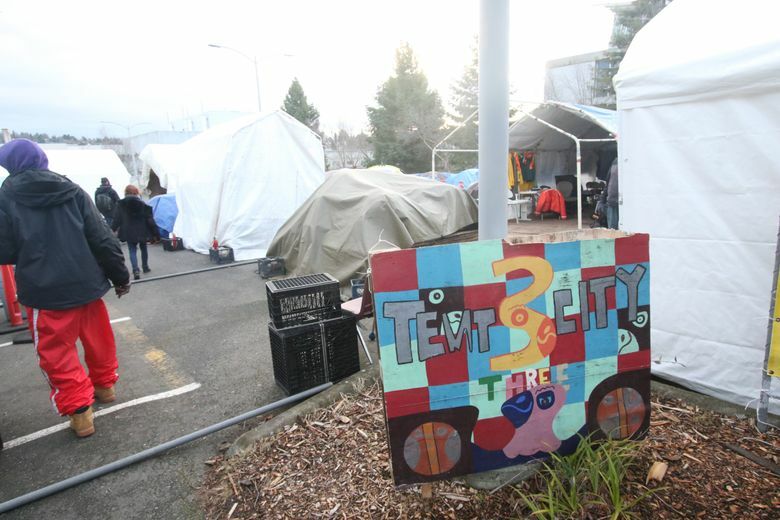 The UW began hosting the homeless camp in early January, and it’s believed to be the first time that a major public university has ever hosted a tent city on its campus. There was some opposition from faculty and staff, but many more supported it. Tent City 3 is an authorized encampment operated by the nonprofit Seattle Housing and Resource Effort (SHARE) and its ally organization. It has about 60 residents. “When you have the city and county declaring homelessness an emergency, it’s part of our public mission to be part of the solution,” said UW President Ana Mari Cauce in a brief interview last week. 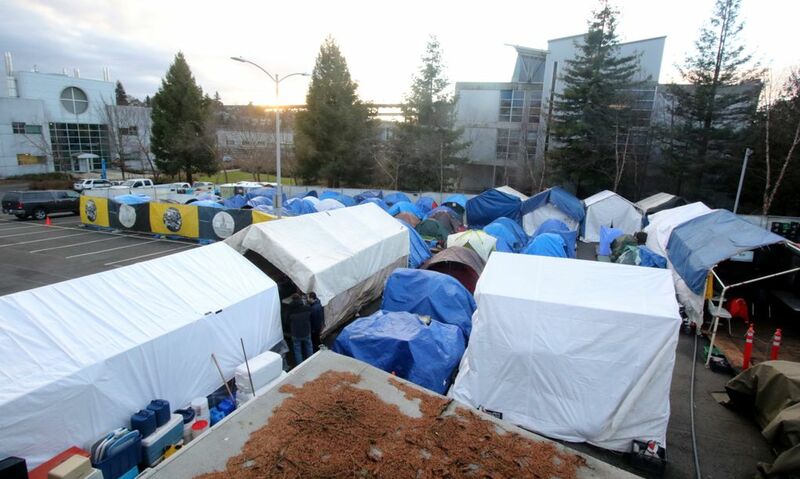 Just as at Seattle University and Seattle Pacific University, two private universities that also hosted Tent City, the UW’s gesture goes beyond offering a parking lot for the displaced. In the coming weeks, teams of students from the UW’s schools of social work, nursing, medicine, dentistry and pharmacy, as well as its physician-assistant and physical-therapy programs, will offer aid to residents. The work is a required part of a special 10-week course on homelessness offered to health-science students and others interested in the issue. Thetford said the homeless often have a constellation of interwoven health issues that must all be considered as part of treatment. A homeless veteran, for example, still may be experiencing trauma from the battlefield, as well as a physical disability, while also trying to raise a family. “I try to get the students to see all of the different kinds of issues, and how they intersect,” said Thetford. She is a founder of the 45th Street Clinic in Wallingford, which works with low-income and uninsured patients, and a lecturer in the UW’s MEDEX Northwest program, which trains physician assistants. Part of Thetford’s vision for the class is to show students that the Tent City residents don’t fit the stereotypes. One example: “We think of them as just hanging out on the street,” she said. But Tent City is largely empty during the day. Its residents are at work, or searching for work, looking for a place to live, or going to school — which is why the UW students must do their visits at night. Thetford has been working with the homeless for more than two decades. She says many of us know somebody who’s been displaced from permanent living conditions for a period of time, even if we may not think of them as being homeless. She has relatives who have been homeless — “even in my family of white, middle-class professionals, with really good incomes. “The thing is that the homeless are not ‘them’ — they’re ‘us,’ ” she said. All three of Seattle’s universities have now hosted tent cities. But the UW’s decision to host one on the campus of the state’s largest university may have the most impact of all. SPU, a private Christian school, has hosted Tent City two times, and plans to host it again in winter 2018. Seattle University, a Jesuit school, was the first university in the country to host a homeless camp, in 2005. At first, when Seattle U. President Steve Sundborg was presented with the idea, “My gut sort of dropped,” he said. Sundborg, a Jesuit priest, later got behind the proposal. Twelve years after the campers packed up and left, he believes hosting the tent camp resulted in lasting changes for the university. “We overcame our fear of the homeless — we didn’t realize we had one,” Sundborg said. Sponsoring Tent City 3 eventually led Seattle U. to launch its Youth Initiative, a 6-year-old project to help residents of the low-income neighborhoods surrounding the university, with a special focus on academic help for children enrolled in area K-12 schools. Both Seattle U. and SPU organized classes around homelessness, and they encouraged faculty and students to volunteer in the camps. SPU sponsored forums, films and other events, and provided nightly meals in the dining tent. 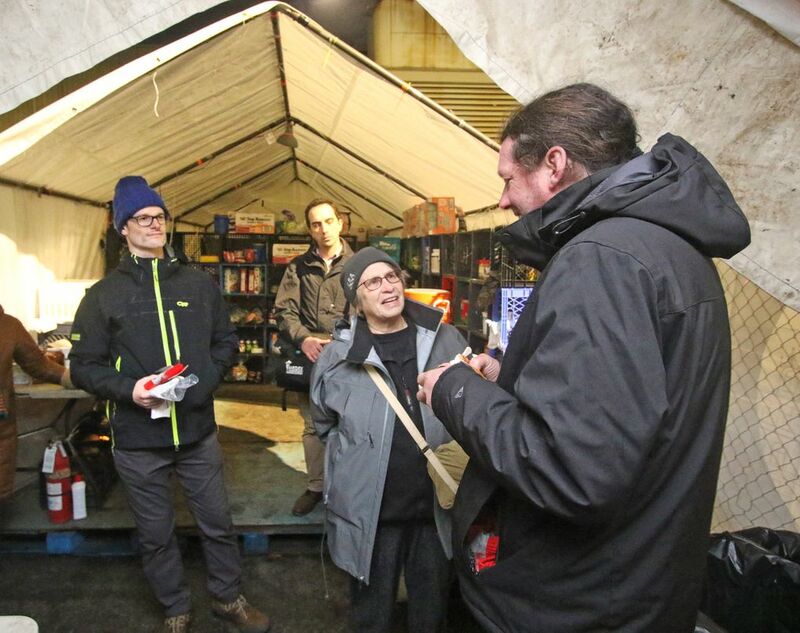 Residents offered tours of the camp. In other words, hosting the camp was good, but it wasn’t enough. SPU is thinking about ways to encourage more people to get involved with homeless issues, McKinney said. And that university has created a permanent committee, which Snedker chairs, to work on the task. At the UW, the relationship between the camp and the university is still evolving. That’s because a camp leader, feeling overwhelmed by the number of volunteers in the camp that night, asked the team to leave. “They said, ‘This is our space, and we need to have our space back,’ ” Thetford said. That’s part of the tension inherent in living in the open, on the edge of a large public university, among people who are trying to hold onto a sense of privacy and dignity, Thetford said. The volunteers will try again another week.